In some ways, seeing who another artist would bring to our attention (especially when provided with only two slots to do this with) offers us another glimpse into the principles of engagement and research legacies that feed their own creative processes. Both DoublePlus program’s I attended (I, unfortunately was out of town for David Parker’s but I would argue that his vision as evidenced in his Soaking WET Series, his Danspace “Body Madness” Platform contributions, and the artists he brought to DoublePlus this month could be included in my statement) were in a way an extension of luciana’s and the 3rd week’s Cynthia Oliver’s own performance works. 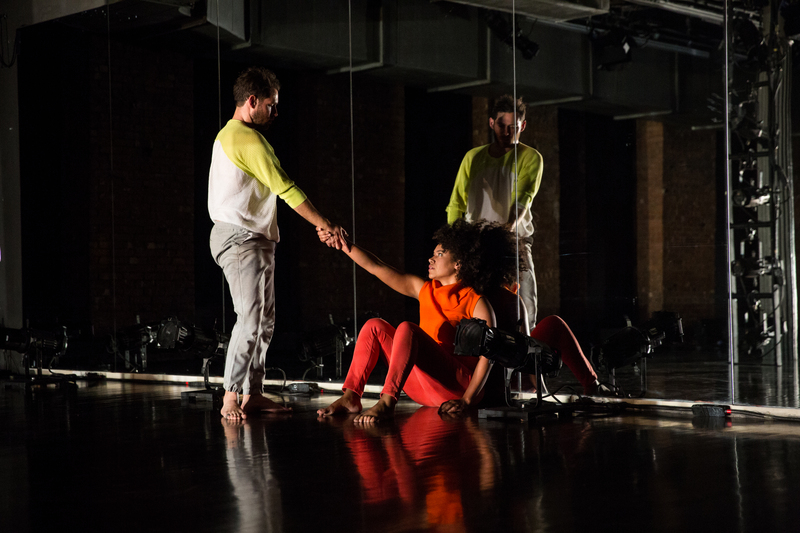 The pairings made sense, though contrasting in approach, tone, effort, structures and bodies, there was a poetic connection to the curatorial voice that fed the evening, a triangulation back to shared histories, or politics, or practices. And, special because I’d guess that the curating artist was less burdened by having to quantify programming choices through box office numbers (whether meant to reflect fiscal responsibility/accountability or impact on community) which brought other artistic concerns to light without worrying about popularity in our exhaustive market-driven landscapes, though over the past two years they’ve clearly brought new audiences into a downtown theater space. luciana spoke to this as well: “To be honest, at this point in time, with the apocalyptic state of the present world, right now what feels most important is to consider what the role of artists and of dance is in creating change, and not ‘how can I make it into the market in this career path’. That question leads to frustration and competition between peers. I hope that we can move towards more collaboration and a cooperative kind of making, and away from competition and the scarcity model.” Amen, sister. Naomi Elena Ramirez’s The Temptress, Seductress and Other Woman was a time-based performance installation, or it could have been. Coming from both a dance (BA at Berkeley) and a visual art (MFA) background it would seem that she’d be equally as comfortable inhabiting a gallery as she was filling up the theater with her compelling presence. In fact, my primary qualm was that I didn’t get to spend as much time with the projected images on the floor that she then replicated live on-stage. Although, I was able to view the images in the lobby afterward. Naomi created a performance score using graphic images of herself in sexualized positions she’d gathered from “mass media and literary representations, academic writing, movement improvisations, and her own life experience.” In promotional language on her own website she explains that “the work exists as drawing, as score, as performance, and as process, a process of translation and embodied reading.” It was a compelling and provocative blend of design and dance, wherein the visuals help design and define the dance, and the dancing enlivens the design. It feeds from her first-person narrative and results in and from scripts that bring her singular experience of the world into alignment with many of our lives. The sexualized latina becomes multiplied on the floor and then transformed into a latinx form, not tied entirely to gender, despite the gendered origins, or species – she’s a particularly fascinating spider. Oren Barnoy’s work was titled with a symbol. Something that swirled around itself with thicker edges and fine curves, without obvious beginning or end, it served as the perfect descriptive container for a work that was strikingly relentless in its labor of movement, but transcendent in its effect. There was a persistent pulse that fed the continuity of action as Paul Hamilton and Greg Zuccolo alternated solos, progressing through a ritualistic accumulation of repeated effort and focused attention. The material was vigorous, Paul’s sweat was flying, but it looked kind to the bodies, sustainable and ecstatic. The dance flowed through and over me at times, I felt a strong desire to participate, to dance these two dances alongside them once they simultaneously conducted their daily prayers in the same space. I wanted worship at this altar, to join in the fervor of movement, to invest in the continuation and exultation of the spirit. 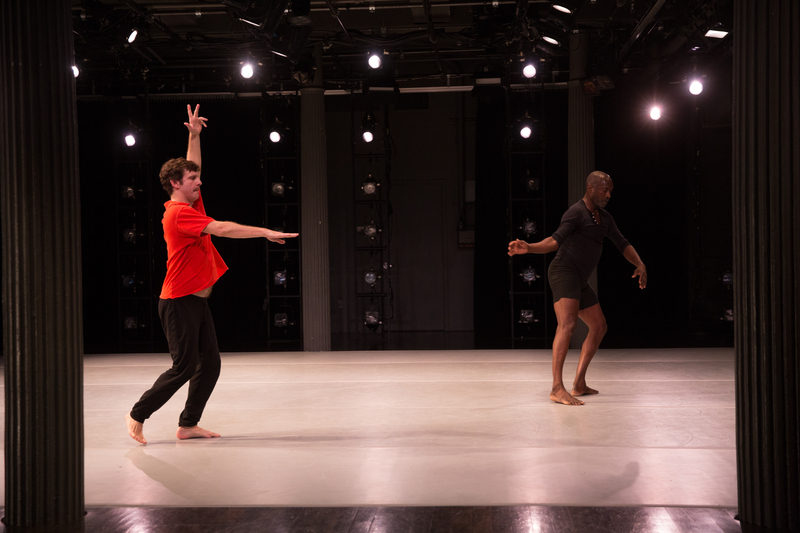 In the 3rd week, on the program from Cynthia Oliver, Lela Aisha Jones brought us into a spiritual realm quite different from the frenzied aspirations inside Oren’s piece. Her “Jesus & Egun” included, in a voice-over narrative, a premise from Dr. Nzinga Metzger that “Jesus is an overworked ancestor (egun)” being expected to handle complaints better left to small claims court. In her restorative work, I was lulled into a warm, dreamy state – edging up (after the bitter cold of that particular day) to sleepiness as I bathed in the amber glow from Asami Morita’s lighting and the peaceful, or perhaps fatigued, surrender of the dancers as they draped themselves over their chairs. 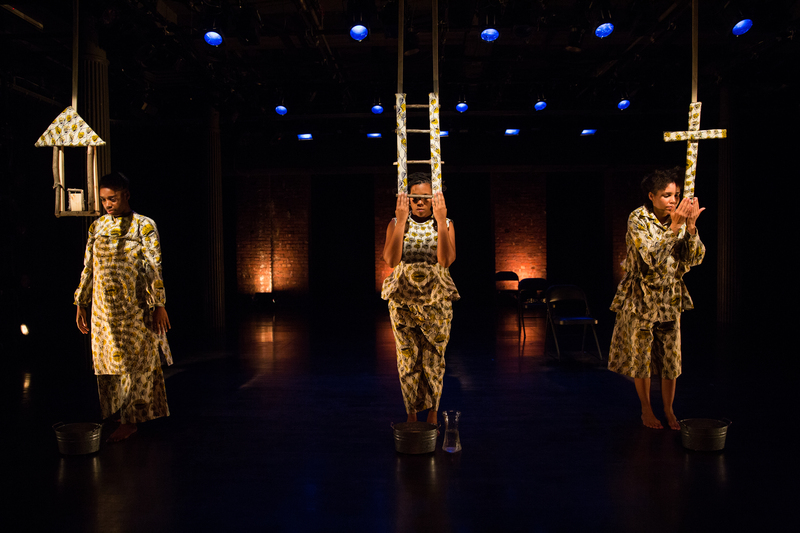 As she called upon multiple ancestors and utilized 3 buckets of water placed at the edge of the downstage, underneath hanging totems of a house, a ladder and a cross, she evoked a rich, landscape of multiplicity and meaning. As Cynthia notes in the program: “She examines how Africanist belief systems and resultant ways of moving continue to be useful for black people negotiating very challenging and violent spaces – often disguised as something else.” Here, Lela, Zakiya L. Cornish and Patricia Peaches Jones inhabit “Mothers of the church,” the pleasure of House and the feminine energies of Yoruba. 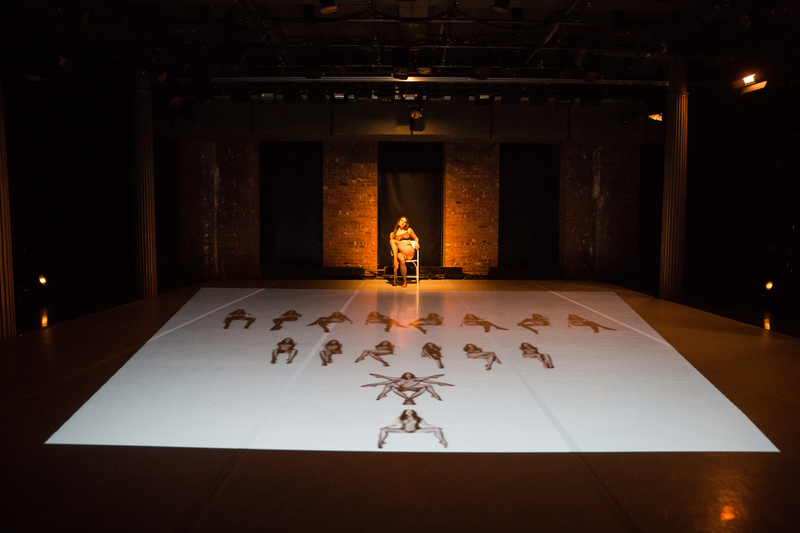 Their collective dedication to diasporic practices and the body as a vessel for the kind of epic histories of displacement and continued renewal soaked the work in a rich embrace. For all those choosing self-care over numbness, delving into racial, sexual, ideological, environmental trauma’s past, present and projected rather than opiating through denial, Lela’s practical research will become vital to sustained well-being, to battling the kinds of ailments internalized and made hereditary through endless cycles of oppression. We cannot let ourselves become sick over this. There are many who have come before, we hope there will be many to come after. Leslie Cuyjet. Ah. Leslie Cuyjet. I was transfixed by her in Cynthia’s “Boom!” at NYLA a couple years ago. I was transfixed again watching her in “Alike,” a duet for her and Darrin Wright. Inspired by internal narratives, the dance flew in and out of moments of delightful ridiculousness and stoic collapse. While Darrin moved rapidly through the space, Leslie slowly melted into herself and down. They’d then find themselves in step, up against the mirror, or Darrin would mince about the stage, smiling flirtatiously with the audience and posing seductively. When they where dancing together eyes focused high, chins raised, the joy of striving positively towards some fantastic goal was infectious. When they folded themselves into each other, creating a combined shape and then abandoning the other to try and maintain the partnership alone, the absence was poignant. As they continued coming together, then deserting the other into increasing darkness, only the sound of a sliding body to let us know the cycle continued, we sat in fully bright house lights until they’d both left the space and left us, our shared history, just history now.